not only survived but actually thrived! My wish for you is that you have the best injury and/or surgery recovery possible. My signature coaching style comes from years of training in a variety of techniques, but my passion comes from years of healing from a traumatic injury and all of the confusing thoughts, emotions, and sensations that have accompanied the injury. 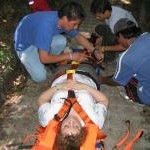 My experiences coupled with extensive study of resources in the psychological effects of injury, mind-body connection, sport psychology, wellness coaching, grief recovery, and strategies for lasting change make me uniquely qualified to help others who are recovering from injury, surgery, or other types of life changes or loss. Along with our personalized telephone coaching sessions which take place either once a week or every other week depending on your schedule and needs, you will be given the materials to create your own Healing Journal which includes handouts, articles, worksheets, tools, and journaling options to help you create goals and action step reminders, track your progress, make notes of questions to ask your medical team, jot down your thoughts and feelings about your experiences, and find quick reference information for your physician, pharmacy, medical history, and insurance data during your surgery preparation and/or injury recovery process. I have trained directly with Dr. JoAnn Dahlkoetter, best-selling author of YOUR PERFORMING EDGE; licensed clinical psychologist; sport psychologist to Olympic athletes, physicians, and executives; former medical staff member at Stanford University Medical Center; and world-class champion athlete. Visit DrJoAnn.com for more information and access to her free e-course on reaching Your Performing Edge. What is the Performing Edge® Method? During our 8 weekly or bi-weekly telephone coaching sessions I will focus entirely on you, listen as you tell me about your experiences, help you create and reach goals, and offer many of the tools of sports psychology to help you Heal Your Best. Specifically, even if you aren’t an athlete, I can help you reach your Performing Edge for a more fulfilling, balanced, and purposeful life. Contact Sue for your free consulation.